Pontiac is beginning its final year since GM announced it was not continuing the brand and probably would not sell it off to another entity. So that leaves a brand to explore some interesting marketing ideas -- that may not have made it when everyone thought the company was going to stay around longer than a year. Of course, I’m being tongue-in-cheek as it is quite obvious the new Pontiac G8 GXP micro-site with MMA Fighter and Maxim Hot 100 girl Gina Carano was conceived well before the late April announcement prior to Pontiac getting knocked out of the “New GM”. “I got your torque right here,” exclaims Gina as I was getting ready for the next round of the Pontiac Street Brawl. 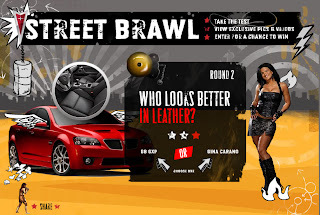 Apparently, a web street brawl involves you taking a quiz to vote if the G8 GXP or Gina Carano looks better in leather or which one has the best power combination. Gina is constantly throwing jabs at you while the Pontiac, for some odd reason I can’t figure out, has angel wings flapping by the side mirrors. Yes, this site is that odd. All of this ridiculousness is just to get you to enter contest a contest and see what an angelic car the Pontiac G8 GXP is. It’s just a really weird site. I don’t know how else to put it. You can be her “arm candy” at an upcoming MMA Fight. She is #16 on Maxim’s Hot 100, but for some reason I don’t get her appeal. That could be my issue as it took me forever to get Danica Patrick’s appeal too, until I saw her recent shoot for Sports Illustrated. There is some unique content developed for the site featuring Gina talking about her history, showing off her skills, and filming of the marketing photo shoot. Unfortunately, the car gets very little content other than a simple 360 of the exterior. Of course, you can head out to Pontiac.com to learn more about the car, but it could've been a bit more interesting pitting the speed of Gina's punches against some performance video of the G8 punching its rev limits. The G8 GXP is one of the better products at GM. Unfortunately, it appears to be heading to car heaven if this Street Brawl site's use of angel wings is any indication of the car's fate. With the economy where it is today is it very important to purchase body kits that you can count on and won’t let you down. The slightest equipment set back right now could be the difference between in business or bankrupt.